Do you have trouble saving money? There are always unexpected things that you need to pay for like car repairs, gifts for loved ones, or the much-needed night out after a long day at work. Putting away money to start saving can be a difficult habit to start, but it doesn’t need to be. There are options for those people who need a bit of extra help to get started. An example of this is the Digit app! This app is a money-saving machine that you can have on your phone right now. It makes saving so much simpler and does it automatically. Now, no app is perfect, but in this honest Digit review, you’ll see what the app can do for you. Click here to download Digit and start ! What is the Digit app? Digit is an app that automatically sets aside money for you while you go about your daily business. The app will pull out small portions of money from your checking account so you barely notice that you are saving. This system works well to show you how much money you can save just by taking out a few dollars here and there to be stored away. Before you know it, you’ll have saved enough to go on that vacation you’ve been planning in your head for months. Click here to download the Digit app and start saving today. When you sign up, Digit will start by analyzing your daily spending habits. Whether you buy two coffees, your lunch, and snacks at work every single day or make the random candy bar purchase during the week, Digit will customize your savings to your specific spending routine. When the app sets aside money every few days, it goes right into the Digit app on your phone and that acts as a savings account. The app also allows you to set up multiple savings accounts for a variety of reasons. Once it has an idea of how much money you use, it will start setting aside a proportionate amount of money to your spending. This means if you only spend 50 dollars a week, Digit will not be setting aside 45 dollars from your checking account each time it moves money over. But it will set aside maybe 5 dollars. And then when you get paid next and you get a bonus, it may set aside 15 dollars. Digit will understand what you personally can afford as your spending and earning changes. This can range from 5 dollars up to 30 dollars. It all depends on you. As time goes on, you begin to save up money that may have been easily spent had it been sitting in your checking account. Click here to download your new savings account. How is Digit different than other savings accounts? Digit does not require you to have a minimum amount of money to start the account. This makes saving available to anyone! There is also no cap on how many times you can withdraw money from your Digit savings. Need access to your vacation fund? No problem, take it out and get your vacation started. Need the money for your grandmothers birthday present the same day? Not an issue for the Digit app. Digit also does not require a set amount of money to go into the account monthly. The app figures out your habits and sets a pace that will work specifically for you. Click here to start your personalized savings account. You can sign up on a desktop or within the app itself (IOS and Android). The sign up process is intuitive and simple. Creating a username and password is quick enough. Once you’ve done that, you choose your bank. Digit will work with 2500 banks across the United States. Once you are signed up, you can decide what kind of things you want to save for. Saving for a new phone or for a trip to the Bahamas? You can do both and put money into different accounts for your different needs. Signing up is simple enough and quick to start your savings fast. Click here to sign up with Digit in five minutes to start saving. Should you trust the Digit App? Now, you may be thinking, should I trust this app to take my money and not run off with it? Your digit savings (the money that accumulates in the app as it sets it aside) are actually FDIC insured up to $250,000. What does that mean, you ask? FDIC stands for the Federal Deposit Insurance Corporation. The FDIC basically protects your money when you, the depositor, put it into a bank. You can read about the FDIC here if you want to learn more. So with the Digit app, you are protected and assured that your money won’t just disappear on you. Digit also offers to reimburse any overdrafts that may happen as a result of the automatic saving (should it happen). An overdraft would be if you had $15 in your checking account and Digit decides you can save $30. They take it and put it into your Digit savings account, only to create incurring fees from the overdraft of your bank account. They are certain that an overdraft will not happen, and if it does, they have you covered. Click here to start your savings account. Where does Digit exceed expectations? Now we can get to the specific ways the Digit app provides for its users. The best part of a Digit review? We get to share how this app can make saving money accessible to anyone. While Digit moves your money, the app will text you to let you know what is going on. The texting feature is one of the best features Digit offers. You can do just about everything through the text message feed. Digit will move money (withdrawing and saving), pause savings and even show recent transactions all through SMS messaging. Digit does the thinking for you and just checks in to make sure it’s okay through the comfortable medium of text messages. For the younger crowd, this is a unique way to engage those who may not be natural savers. Click here to sign up with Digit and start saving now. The Digit app makes it easy to start saving in a small way. Savings accounts can be overbearing when they require minimum balances and monthly deposits. When you’re not totally financially secure or just feeling unsure of how to start, Digit is a great way to ease into the great habit of saving. The automatic nature of Digit is the peak of easy saving. It is low commitment and simple to use. Perfect for anyone, experienced and inexperienced alike. Click here to start the habit of saving. It is certainly reassuring that the money going into Digit is backed by the FDIC. Your Digit savings won’t just disappear on you when you are about to withdraw them from the app. Digit is legit and it can be trusted. The app is backed even by Google! Another blog, Finance Gourmet, explains a bit of the beginnings of Digit. They didn’t come to scam anyone but they grew out of good faith. Click here to start your very own Digit account. Again, Digit does well in making sure your trust isn’t broken. The app goes through a similar process as banks to make sure your information is not vulnerable to theft. You can read more here about how Digit protects your data. You can be sure that Digit is doing everything they can to keep your trust. Click here to start your safe savings account. If you save money using Digit for 3 consecutive months, you will get a 1% cash back bonus on the money in your account. So for every 3 months that you save, you are getting that 1% back each and every time. Digit offers this as a bonus simply because the account does not earn interest (as a savings account normally would). That little bit of incentive can make saving even better. Click here to sign up for Digit. One of the smaller but cool features that Digit offers is friend referrals. Once you have signed up, if you recruit a friend, you can earn 5 dollars. It is as simple as that. Tell a friend how they can save as you continue to save as well. Click here to start saving for you and your friends. Where does Digit fall flat? Now this wouldn’t be an honest Digit review if there weren’t any pitfalls to share about the app. While Digit is an awesome way to get people saving, it doesn’t come without its hiccups. One major upset with the app is the lack of available customer service. There is a help page and FAQ page that may answer some general questions you could have. Nowadays, many companies offer live chat on their websites and telephone numbers to reach customer support. Unfortunately, Digit offers neither of these avenues. Email is their only option. Especially as an app that deals with money, Digit would greatly improve its services if they had more available options for customer service. While Digit is an awesome way to get people who normally can’t save to start saving, it isn’t really made for long term goals. If you need motivation or help to save for a car or a down payment on a house, Digit is not the way to go. Unfortunately, since it is just an app, it can only do so much. It does help with those people who have a hard time getting started, but once you get going, you will have to move on. While Digit does offer its services free for 30 days, there is a monthly fee after that. This means that anyone can sign up or download the app. But after that first month, you need to pay to save. The 1% cash back feature can offset this fee. So while you can technically wave the fee, you are still paying for it. Click here to start your new savings account. Digit is based in San Fransisco and is currently only available to US residents. This obviously limits who can access the app. And while there is a multitude of banks that Digit can work with (2,500), there are still many banks that Digit does not work with. So if you are not in the US or have an independent bank, Digit is unavailable. They would do well to offer more options for banks and make Digit internationally available. Click here to start your Digit savings today. In this Digit app review, I shared with you everything you need to know about Digit. What it does well and what it doesn’t do so well. But now you get to decide whether you want to invest in saving your money in a simple way. 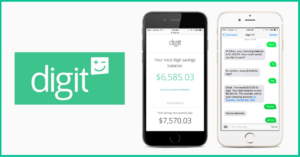 Digit is a great tool that encourages its users to save by doing it for them! This is a really innovative app that will change the way you think about saving and I believe it can make anyone into a money saving fiend. Give it a try and see how much you can save in your first three months. Click here to create your own Digit savings account.